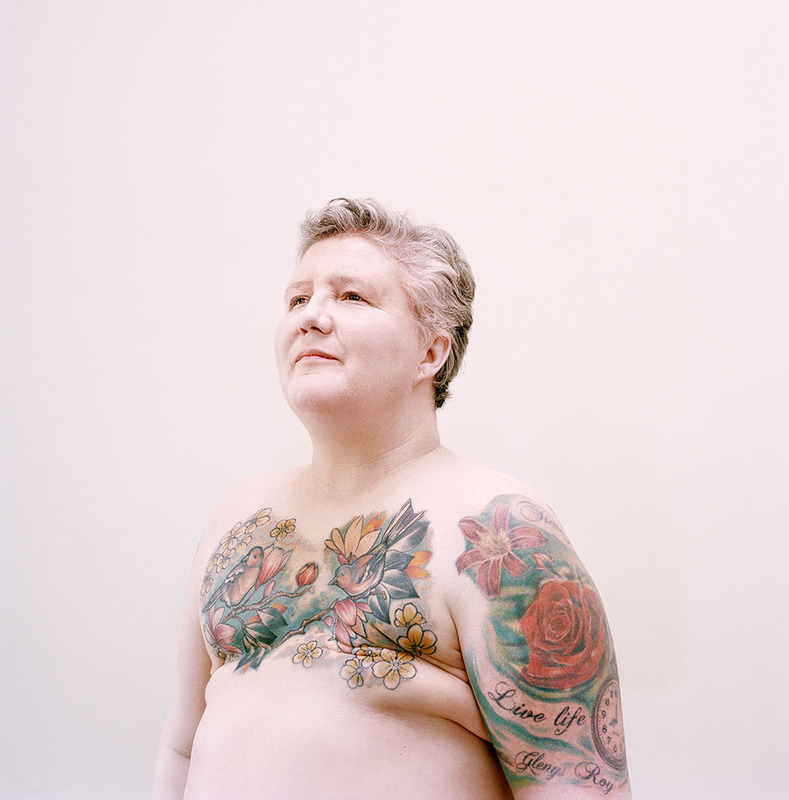 The series of portraits, Reclaim, is by photographer Kate Peters and art director Gem Fletcher. Scanning social media, they noticed a “new tribe” in the form of the P.ink movement – an abbreviation of ‘personal ink’. P.ink seeks to connect breast cancer survivors with tattoo artists. Peters and Fletcher posted calls on social media for women to take part in a photoshoot and contacted tattoo parlours around the world to put them in touch with their customers. “Gem and I had seen mastectomy tattoo images online, but not anything more than Instagram shots by tattoo parlours. We thought it would be great to try and tell this story in a more meaningful way,” says Peters. “I had a very early diagnosis, but the cancer was very extensive. It had filled my entire left breast. That was in 2010, when I was 29. I immediately started looking into breast reconstruction options. The idea of also tattooing really resonated with me. It enabled me to put my own stamp on my scar, something meaningful to me. It also allowed me to take control of my treatment plan and some part of that journey. A few years later, I found out about P.ink. They had brought together reputable tattoo artists from all over the US who wanted to help women heal from the physical and emotional part of mastectomy. It was exactly three years to the day after receiving my diagnosis when I went to get the tattoo. On the day I met Roxx, the tattoo artist, she asked me to share my story and she started sketching while I talked. After chatting for a while, she showed me a design. I loved it and, strangely, the design fit my body exactly. No alteration was needed. It was made perfectly for me. I learned something about myself that day. I realised I had been avoiding looking at myself in the mirror, averting my eyes from my chest and my scar. I didn’t realise it was a problem for me until the weight was lifted. Suddenly I had this beautiful piece of art. I stopped looking away. “I was diagnosed on 2 October 2015 – triple negative breast cancer. In January 2016, I had a bilateral mastectomy and took early retirement on health grounds. Sadly, there is a very high chance of this cancer coming back. But I have lived life to the full. I made my bucket list – to visit all 32 counties of Ireland. I took up painting while in radiotherapy and haven’t stopped painting since. I’m about to have an art exhibition. Looking back, the only way to handle it is to be positive. I think: ‘I’m still here. I’m fighting this.’ I have no intention of letting it beat me. I had my first tattoo at 21. A tiny little rose on my shoulder, at a time when women weren’t really having tattoos. It took my father five years to find out and he still went crazy. In 2003 I had an accident while horse riding and broke my spine. Once I recovered, I had both hips replaced and could walk again. I had a dragon tattooed on my spine. When my daughter left home, we had matching gecko tattoos on our feet. My half sleeve is the story of my family, representing my children, the children we lost, my husband.